Steps: What Outfit to Wear? On more than one occasion in life I’ve wished for a personal shopper. Am I the only one? Why do I not doubt it...☺ Maybe because many of us aren’t exactly fashion minded. Oh, we may know a good outfit can make us carry ourselves a little straighter, a little sassier, but putting it together? I often have no clue where to start. Thank goodness God didn’t leave us hanging with the clothing we should wear. Because while a good outfit may put a smile on our face, a good character will shine it for others. I know, I know, sounds like a line but we all know it’s true! True beauty honestly comes from the inside. Which is why God gave us the list in Colossians three. So let’s read it again. Compassion, kindness, humility, gentleness, and patience. Oh boy. And it’s not done. Bear with others. Forgive them. Let’s hang here before going onto that last one, because maintaining all of these is as daunting as trying to put together an outfit for a New York runway. Here’s the thing though, God chose these words on purpose. He knew the combination was perfect. He knew they would layer together with just the right color and style to blow those around us away, giving us a depth of beauty we could never create on our own, and leaving people to ask where they could obtain the same outfit. And while those qualities may seem like an impossible list to wear, let’s actually think about clothes for a moment. We need to pull them on every day. They don’t just show up, we have to choose to don them—which means there is a conscience effort involved. It also means they’re fresh. Just like we don’t pull our clothes out of the hamper, we need to take our character newly from him every morning. Makes me think of Lamentation 3:23 and how his mercies are new every morning. Fresh. Ready for us to dip into and pull on ourselves. There’s one last piece in that list too. The accessory that cinches it all together: love. Like a belt completing our outfit, love gathers all the pieces together and holds them there in perfect unity. It’s the piece that that cannot be missed or everything else falls apart. Anyone else ready to get dressed for the day? Lord, help us to find our worth not in what we are physically wearing today, but in the character we are building in you. Help us to chose the pieces that grow us in relationship not only with you, but others too. 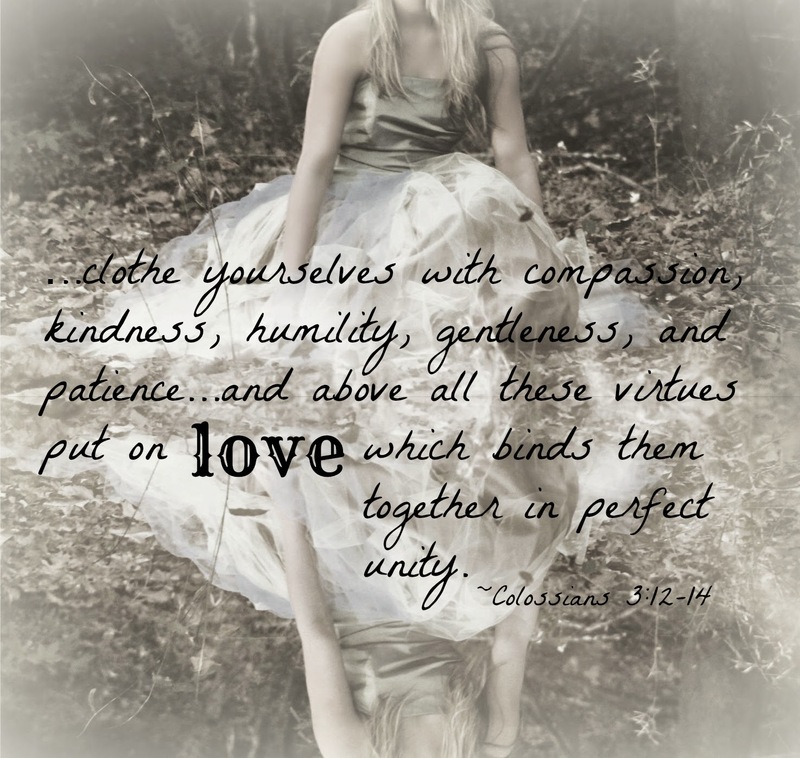 Let our spiritual clothing be belted in love and allow it to draw others to you, the one who designed it all. Amen. I'm having a little trouble getting my patience on. LOL Nothing new. Thanks for the reminder of how we have to don these daily. I needed this prayer today as I sit here not thrilled with the outfit I chose for work. Growing up, I used to pick pretty outfits. Even in college, I didn't buy something unless I loved it. Still okay. A few years ago, I realized I lost any fashion sense I had. I blame it on raising sons. I can help anybody pick out a sporting out fit, and I've sat outside at tons of ballgames and tennis matches. I have all kinds of sports T-shirts and jeans, but not nice outfits. Your post today helps me not worry about the right or wrong clothes. I'll walk out of the house today, and with the help of the Holy Spirit, I'll wear love. :) Jackie, I understand! As women we do love fashion, and there's nothing wrong with that! We just can't put our worth in it, which I know I struggle with also. Not going to lie, the right outfit sure can make me smile...and vice versa. But I'm learning this right along with everyone else--hence this post. It's truly is what's on the inside. I definitely think the best clothing is the accessory you mentioned--LOVE! Love covers all! Thanks for this smile-making post! You're so welcome, Jill. Glad I could make you smile, friend!